Tony Wolf joins the roundtable this week for a pre-Batman v Superman discussion, and he brings with him his newest autobiographical comic, 1-800-DEAD-ROBIN, which tells the tale of a young comic fan in the late 80s who set out to kill a teenage boy. We're speaking of course, about Jason Todd, and DC's call-in vote to save the life of the second Boy Wonder, after a brutal beating at the hands of the Joker! Would Batman get there in time? Pete's Basement Season 7, Episode 29 Extra! Ramon, Steve, and Pete talk X books! Death of Wolverine 2, Magneto 9, Nightcrawler, and some Avengers sprinkled on top for flavor! Some more viewer questions and oh yea, Pete's really drunk by now! So enjoy! 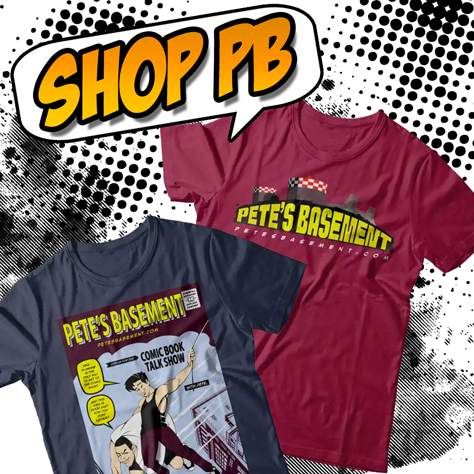 We announce the winner of the second Pete's Basement NYCC ticket contest! And ya' know what? Why not start A THIRD!! Steve pulls a hat trick, coming back for the third show in a row! He and the boys are ready to unleash Hell as they review a bunch of #1's this week, including Rot & Ruin, Copperhead, and Grant Morrison's Annihilator, to name but a few! Do I even have to say it? Just click the download button and we'll pretend I didn't.